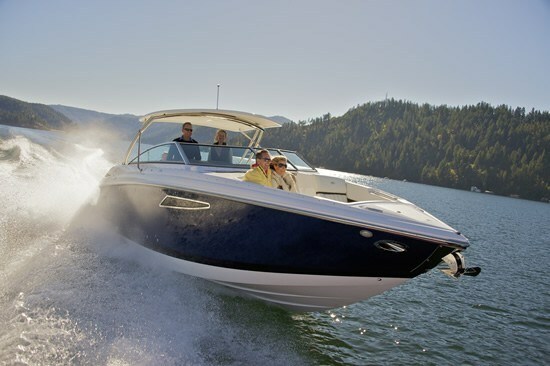 Cobalt Boats of Neodesha, Kansas offers a total of twenty-six models for 2013 in six series from twenty to thirty-three feet. The 336 BR subject of this review is brand new for 2013 and the largest of eight bowriders from twenty-three feet to thirty-three feet. But the 336 BR is not only a huge bowrider, it could be classed as a cuddy or even a mini-cruiser as it also has a separate cabin and separate head compartment as well. Let’s let Cobalt describe this innovative layout. “The cabin lies below the helm. At once snug and expansive, with a sofa stretching out there nine full feet and swiftly changeable to a berth capable of sleeping two adults and a three-year-old interloper, the cabin makes full and fine use of its spaciousness, by turns air-conditioned or heated as the day's outing or the week's cruise might require. Inside a cabinet designed to very specific purposes of entertainment and efficiency come a 32" LCD HD television, a DVD player, and a play-station hookup. The portside head compartment looms enormous, ready to double as a shower seat.” So indeed, is the 336 BR a bowrider or a cuddy or a cruiser or all three in one? Let’s explore this further. 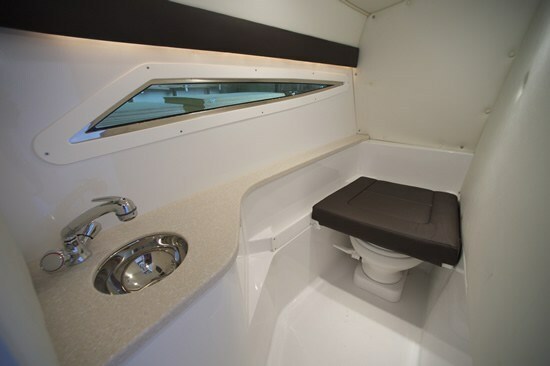 A step up on the starboard side from the extended swim platform takes you onto the transom walk-thru leading to the cockpit past the large aft sunpad with adjustable headrest. A transom storage compartment and a storage/icechest is provided here. This sunpad headrest doubles as the transom portion backrest for the L-shaped portside lounge seat which extends all the way forward to the passenger dash where another adjustable, double-wide head-rest/backrest forms the forward facing passenger seat or rear-facing lounge. Centred in this lounge is a standard, storable cockpit table. On the starboard side is a curved double bench seat, ahead of which is a molded cockpit galley with stainless sink and grabrail with storage below. Underseat storage is provided throughout. 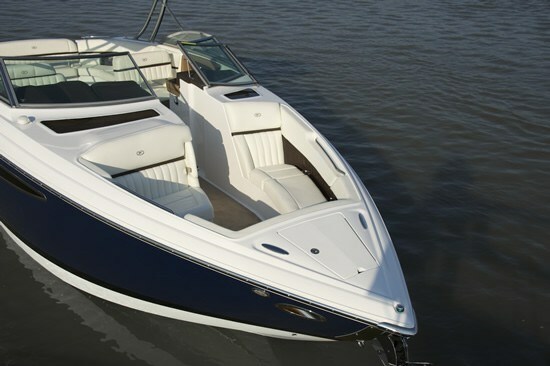 Neoprene-backed, 40-ounce, snap-in cockpit and transom walk-thru carpet is standard and may be optionally upgraded. You may also add a cockpit refrigerator and/or microwave to the galley unit. Shorepower is standard equipment as is an air compressor for inflatable watertoys. A double-wide helm seat with flip-up bolster faces a large dash ahead of the black leather wrapped stainless steel steering wheel. The aluminum backed dash panels are topped with a custom stitched composite helm eyebrow. Most unusual for a pleasure boat is the standard inclusion of high end Livorsi engine controls. A Garmin 740 GPS package is optionally available. 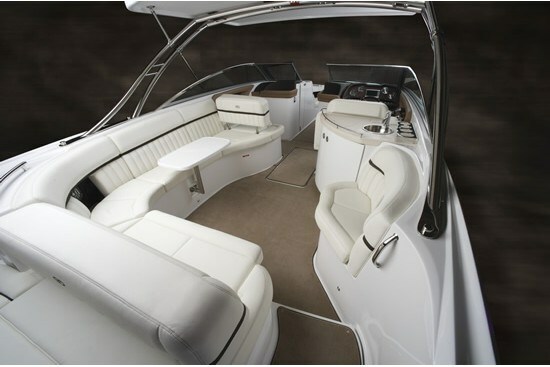 Walk-thru doors lead to the bow seating area with a forward-facing double-wide starboard seat with flip-down armrest. An L-shaped lounge/bench seat fills the forward and portside of this area, all with storage below the cushions. But we’ve just skipped past two of the most exciting areas of the 336 BR and these lie within and below the port and starboard helm consoles. A hinged door in the port side passenger helm leads to a fibreglass lined head compartment with standard sink console with shower attachment and VacuFlush head. A hot water system is standard. More unique is the hinged starboard side door with screened opening window leading down to a cozy cabin with a nine foot long sofa which converts to a double berth. Another opening screened window into the bow walk-thru provides natural ventilation and a large, fixed hullside window provides lots of natural lighting as a second one of these hullside windows does on the port side for the head compartment. Two overhead skylights located just ahead of the windshield also bring light to each of these compartments. The standard AM/FM, Bluetooth Stereo with iPod/USB/MP3 Port (and with six speakers) resides in this cabin and it has a standard dash remote. You can optionally choose the Cabin Entertainment Package which provides a TV/DVD unit and go even further with a cable TV connection, premium sound with transom remote and transom speakers, a satellite radio system, plus an arch-mounted TV antenna. Air conditioning/heating is available for this area which also serves the head compartment. Other notable options include a cockpit heater, a dinette table with receptacles in both the bow area and the cabin, a centre bow area filler cushion, docking lights, anchor windlass, transom shower, underwater lighting, automatic fire extinguishing system and a 5kw generator. Unique Cobalt options include a flip down swim step with or without ladder for the swim platform and retractable dock lines. You may also want to choose the stainless steel arch with your choice of bimini or get this, a hard top. 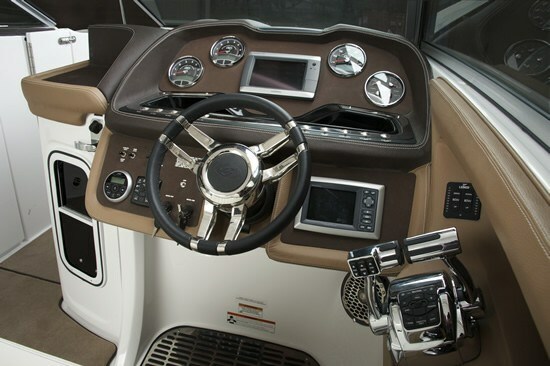 Choose from twin Volvo Penta or MerCruiser sterndrive power with or without joystick-type controllers. 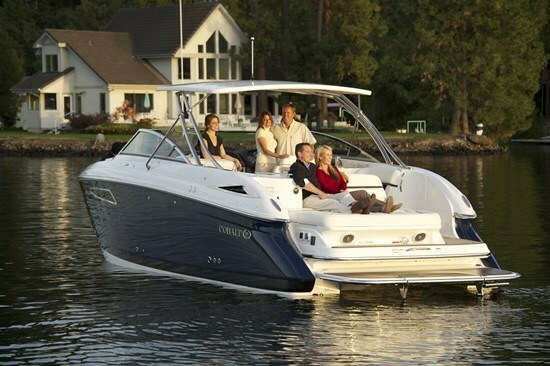 Cobalt calls its new 336 BR a “crossover” – a crossover between a bowrider and a cruiser. Perhaps this describes it, but Cobalt also says, “The new 336 will mean so much to so many, and each lucky owner will find exactly the boat of which she dreamed: sporty cruiser, massive bowrider, accommodating day boat, comfortable overnighter, performance sportboat, flat-out exhilarating machine.” This certainly fully describes it.